Have you ever wondered what a giant bunny delivering colored eggs to well-behaved children has to do with Jesus and his resurrection? Like most traditions and celebrations, Easter has its roots hundreds of years before us. Some argue that what we now celebrate as Easter is a derivation of ancient pagan rituals kept in Europe where they observed the Spring Equinox as the return of the Sun God. An article in The Guardian traces its roots to ancient pagan practices and the story of the death of the son (sun) on a cross (the constellation of the Southern Cross) and his rebirth, overcoming the powers of darkness. It also parallels traditions nowadays with Cybele cult rituals and celebrations involving Cybele’s lover Attis, who was born of a virgin, died and was reborn annually. This spring festival began as a day of blood on Black Friday, rising to a crescendo after three days, in rejoicing over the resurrection. We can all agree that bunnies and Christian celebrations don’t have much of a connection, right? As everything has an explanation, historians have tried to trace these traditions outside the Christian religion (because -shockingly- there is no mention of said bunny in the Bible) and found influences of English and German immigrants in 1700s who brought over to their settlements their pagan traditions. German pre-Christian religions celebrated the goddess Eostre. An old myth says that one day goddess Eostre was walking through a forest and found a little bird dying in the snow. The divinity took compassion of the poor creature and turned the bird into a rabbit (because they have a warm fur and can find food more easily); this way the new bunny survived the winter and then when the spring came, the animal started laying eggs. The grateful rabbit decorated every laid egg leaving it to Eostre as a sign of appreciation. Later in Christian tradition, eating eggs was not allowed by church leaders during the week before Easter, so any eggs laid that week were saved and decorated to make them Holy Week eggs, that were then given to children as gifts. Embrace this beautiful tradition and host a fun egg coloring party using all natural ingredients. Find all the steps here. Sam Born created these cute sugar-filled candies in the 1950s in his candy factory located in Bethlehem, Pennsylvania. According to this article, it used to take 27 hours to make a single peep. Nowadays, 5.5 million peeps are made each day, and more than 700 million are sold in a year. In popular culture, peeps are believed to be indestructible; much has been said and speculated about this topic, inspiring experiments and funny storylines in sitcoms. 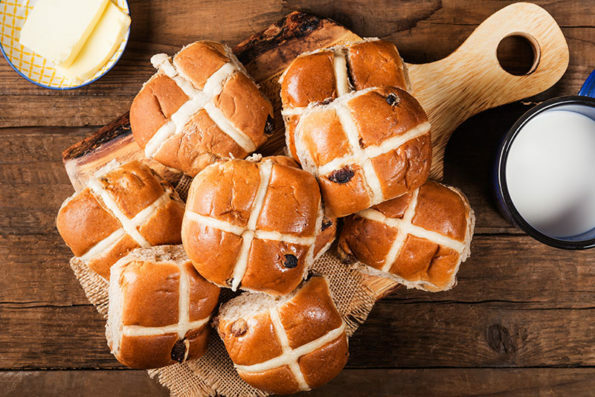 Legend has it, that if you hang a hot cross bun in your kitchen on Good Friday, the bread will remain fresh throughout the entire year. Being mainly a British tradition, in 1592, Queen Elizabeth I decreed that these buns were too sacred to eat any day and could only be sold on Good Friday, Christmas or burials. To disobey this opposition and keep enjoying these warm pastries without being punished, people started secretly baking the buns in their own kitchens. Again, this is a Christian tradition adopted from pagan beliefs. Pagan worshipers celebrated the beginning of a new cycle, so wearing new clothes signified renewal, optimism and good luck. Later, with Christianity, newly baptized parishioners wore white linen robes at Easter to symbolize their rebirth and new life, and it wasn’t until 300 A.D. that Roman emperor Constantine declared that his court must wear the finest new clothing on Easter. Eventually, the tradition marked the end of Lent, which demanded that for 40 days people only cloud wear the same clothes as an act of contrition, so on Easter Sunday worshipers discarded their old clothes for new ones. Although each country has its own foodways, having a big meal with your family is an Easter tradition that has remained for centuries in Christian homes. Sharing food with your loved ones has always been a ritual of celebration and appreciation; historically, pagan societies gathered together to celebrate the equinox, the beginning of spring, further after with the conversion of pagan and Jewish people into Christianity, the tradition gained a new meaning, signifying it as the celebration of Jesus’ resurrection. 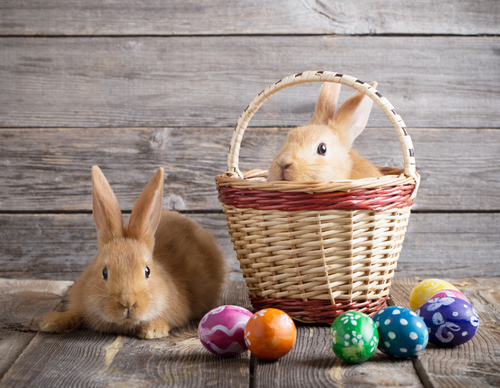 Now that you know everything about Easter customs go ahead and create your own traditions! Start by preparing the most unforgettable Easter Gourmet Brunch for your family and friends, and organize an Easter egg hunt with naturally dyed eggs following these 3 easy steps!